All my work contains the idea, or is otherwise built on the idea, that not going together is one way in which things go together. A recent image I have recently used to demonstrate this is the following. Imagine a dance troupe rehearsing in a studio which is, however, made noisy by road work outside, so they are all using headphones, and the instructor a microphone through which s/he may cut in to the soundtrack and give instructions. The cleaning lady comes in mopping the floor to quite different music which she has on her headphones and to which she too dances as she works. If you filmed it the whole thing would look cunningly choreographed, the relationship between she and the troupe fascinating. I can’t do anything as grand in my work because it’s all done by me, but it’s a goal. In the eighties I made a wide range of works, which included these and the gouaches I made for Borgenicht but also the Village Group. They were works which themselves did not obviously go together. I know it’s common nowadays, but I had a show at Weber’s in the mid-eighties that people at first thought was a group show. Just what I wanted although it would have been nice if people had paid a bit more attention to the thought once they realized it wasn’t several artists but one. I expect that now it would be more possible to think about it, as talking about the practice as a whole has become commonplace. In which regard here’s the basic thing about my practice. It is founded in space, and in this takes for granted and works with the involuntary. When one stares at a flat surface, especially if it’s white, it quickly become a depth. In Mondrian and others, a depth which also advances; in your basic white wall’s or piece of copy paper’s case, an infinite depth. In all of these reliefs I thought of the wall as being something one would really get to think about when looking at these. Their titles refer to three ways of being each of them a pictorial space is next to a bas relief or free-standing element. One is unavoidably illusionistic in the sense that it has something going on in its surface, or more exactly the sense of space its surface produces, the other is literally there but only to an extent. Together the two parts of each work take one from painting as a depth, to painting as object. I have never got over the Renaissance artists thinking of bas-relief as what links the conceptual space of painting to the real space of architecture (their words,) in one’s experience of the interior architectural space as a whole. In Distraction red links the two elements as do the shapes on the right of the painting and on the panel. Immediately there is a difference, one looks into the red on the wall but might be more likely to see what’s on the panel as a surface rather than space, except for the shapes and what they do to it. What happens on the left of the painting has nothing to do with anything in the rest of the painting, or at least hardly anything, it distracts from it. The right hand edge of the panel is not straight, it changes direction about a third of the way from the top and echoes the angle at which the panel leans back towards the wall. In doing so it activates the wall, and one notices that the lower right makes an angle with the white wall while opposite it the canvas meets the wall with white paint at its lower left. The bottom right sits on the floor in a way that supports the panel with leaning back and a curve that accentuates the effect, the bottom left meets the depth of the wall with the already indeterminate space and movement of wavy white. One is distracted from the center by the extremities and from pictorial space within by its spreading beyond the work. Evasion is an action wholly centered on another. Here I think of that as a joke also fundamental to how paintings work. It’s blue, and as with the Baltic painting that to me means it’s like putting some sky on the wall. Color theory says blue is most active when contained, and here that is demonstrated by its uncontrollability. I mean by that that it is really hard to see it as a shape with a perimeter at the same time that one pays attention to what the color is doing. It is not guided by the movement in and out of real space by the relief part, instead it is just as likely to seem to run behind it or to be a kind of depth that is always in front of one while linear movements that are diagonal appear uncertainly within as much as around or through it. The blue and what contains it never really meet and that is the nature of their relationship, it depends on structural evasion. The left hand side of the panel on the left contrasts with extreme right of the relief panel in a way comparable to the same contrast in Distraction, but the distance between the two is much further and movement in and out of space takes place within right-hand element. One has to move oneself as well as one’s head. The extreme left is in my mind made of shapes which are movements that are ultimately floral. These contrast with the shapes made out of parallel diagonal lines, which are geometric and which have an internal logic that affects but does not follow the shape of the panel, but rather is the product of responding to where it is in relation to the perpendicularity of the wall as well as to the internal dynamic’s of the panel’s shape. Discontinuous describes what the work has to be, because there is no direct continuity between the mutually exclusive. Major elements in the work line the two parts up precisely, but one is a painting and the other is a thing. The diagonal lines and blacks which join them decisively also work differently in each. On the right there is only black and white, and the wall comes into it big time therefore and one is not sure of the angle in relation to the perpendicular of the black at the top. The edge of the very top continues a diagonal begun in the panel on the left, which is flat to the wall where this on tilts out for most of its top two-thirds or so, and not in a way parallel to the wall. 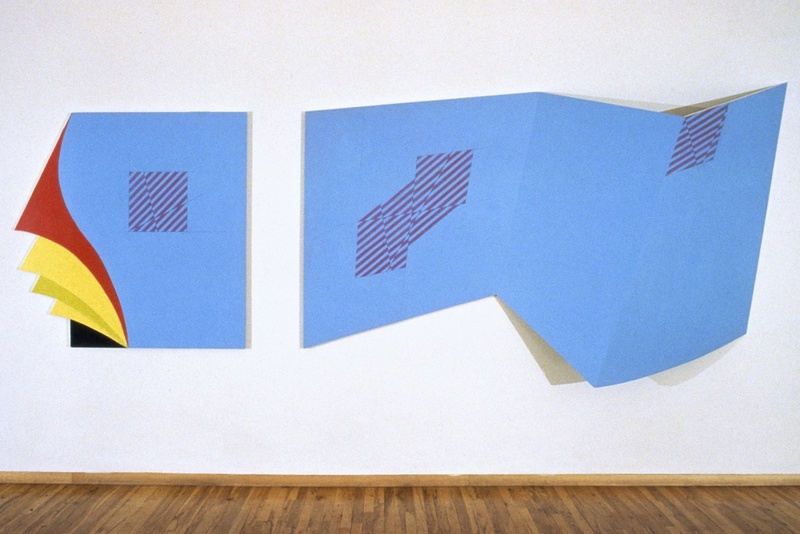 To move left to the flat panel is to go from a three-dimensional movement, complicated by being oblique in all three directions rather than only two, to the unavoidably deep and also atmospheric spatiality of bluishness as opposed to black and white, and also to internal complexity that suggests spaces within spaces that are totally discontinuous with the rest of the painting. There is a sense in which the common thread through all three is obliqueness. Oblique line, oblique angles, both of which suggest space by being legible as readily as movements into and out of it. One may say oblique movements make flatness impossible to experience. Especially when surrounded by color or made of it, whatever is flat having already been robbed of the ability to be anything but a space.